Are you tired of Winter? Do you long for warmer weather?? Do you wish Spring would hurry up and arrive already??? Then it’s time to make your own sunshine! It’s quick and easy to do!! 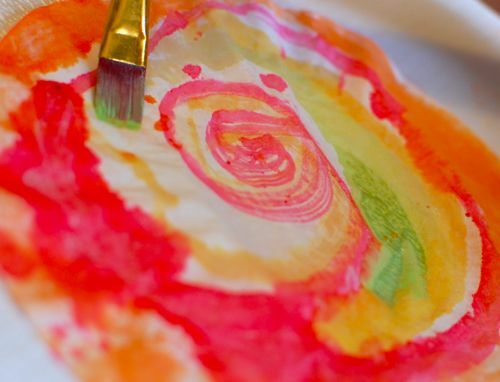 Start by inviting the kids to paint several coffee filters with watercolor paint — the brighter, the better! 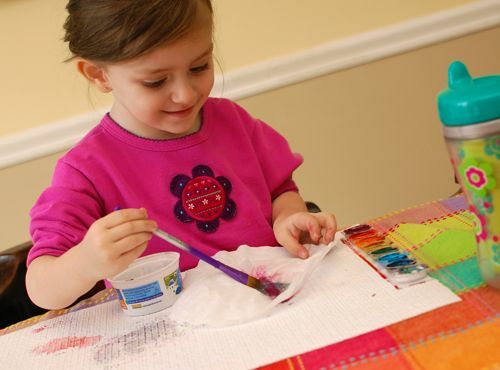 We love painting on coffee filters because they hold up very well to lots and lots of water — a big plus for the little ones! Shelf liner makes a great reusable art mat. Projects stay put while the kids are painting, and the shelf liner can easily be rinsed clean to be used over and over. Once the filters are completely dry, cut them out…..
….to look like flowers!! 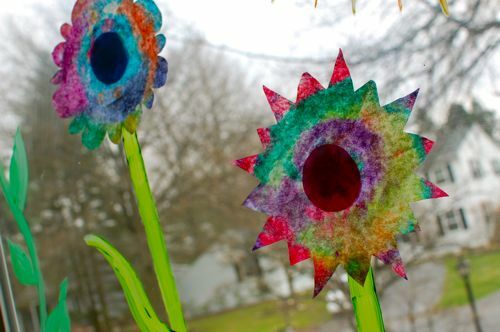 The next day, we attached them to our glass door with washable glue stick. While Emily was in school and Clara was napping, I used acrylic paint to fill in the stems, leaves, and sun. Instant sunshine!!! 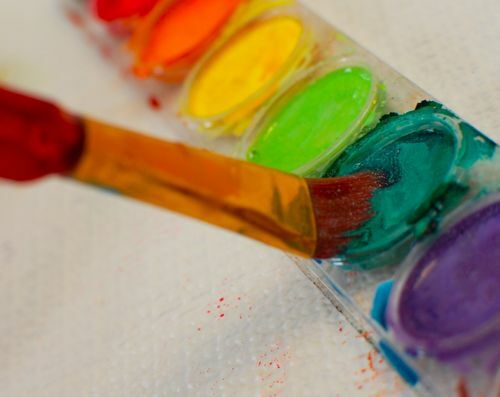 One FFFB reader suggested mixing the paint with a bit of dish soap to make for easy clean up — great tip! Our window displays are getting to be quite popular around here. I love how they make our neighbors smile! Also?? Can I tell you about the reaction Emily had when she came back from school and saw our front door??? Well…..
….this photo just about sums it up!! Behold — the power of paint + coffee filters!! Amazing!!!! Thank you, Michelle! It was so easy, and it made the girls SO happy!! So sunny – making me smile too! Very pretty pictures! I love Emily’s expression. Coffee filters are great for art! so fun! 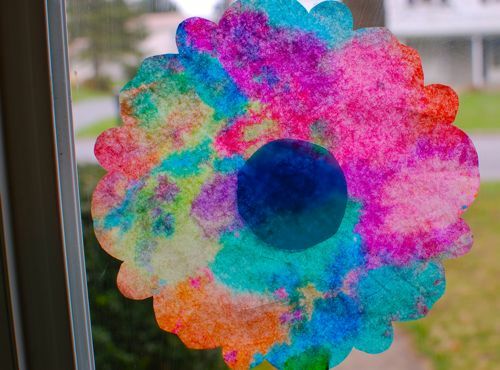 It reminded me that I used to have my kids draw on coffee filters with markers and then use a spray bottle to spray them with water for a watercolor effect. The kids love using the spray bottle! I don’t know it never occurred to me to just use watercolor paints :). 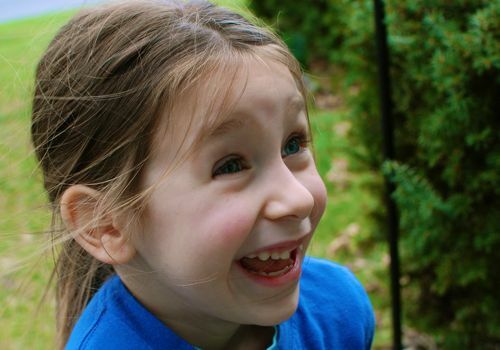 Emily has such an awesome smile! Your door looks fantastic, I wish you lived across the street from us! 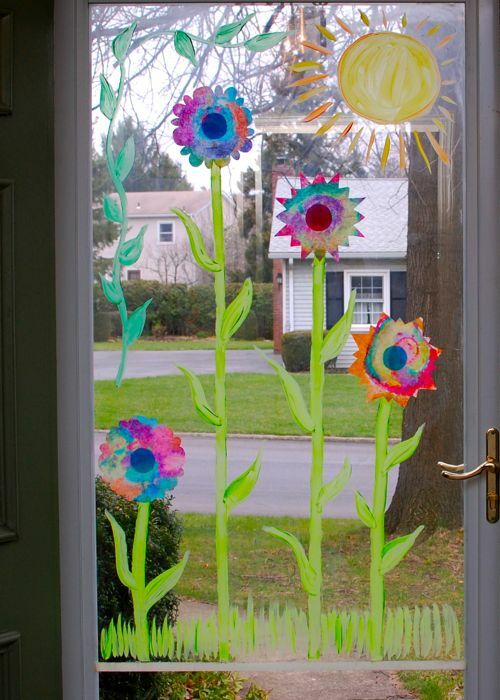 Maybe we’ll do something like this on our glass sliding doors when we get home, since we don’t have a glass storm door to decorate! I just added this to my Tumblr and Facebook account so I wouldnt forget to come back and try it. My only hesitation is getting the paint off the window but we’ll try and if it doesn’t work, I’ll blame you! Haha! Just kidding, thanks for the awesome idea. I’ll post pictures on my blog once we have completed it. LOL — My advice is to try a small section, maybe in the corner of the glass or something. Wait for it to dry, and try wiping it off w/dish soap & water. See how it goes from there. We could use some sunshine around here–I’ll definitely be trying this soon (and I might not even wait until there are any kids around to help me). One question: what brand of water colors do you use? Your painted coffee filters are always so bright. And is that tissue paper for the centers of the flowers? Yes, I traced the bottom of a cup to make them. Have fun!! We painted on Monday, but I didn’t get around to putting them up today. Maybe tomorrow. Oh, this is so very pretty! I might try it here, but use window markers instead. Thanks for the tip about acrylic paint and dish soap! 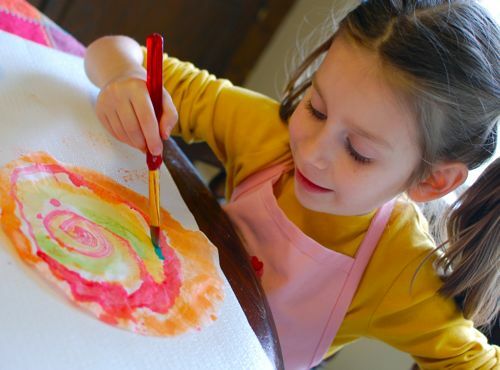 We love coffee filter art too. Your house and everyone in it are always full of sunshine! We’ve started making coffee filter eggs here. But, I do like the flowers, they’re so pretty. I just wanted to let you know that we did the birds on a wire craft and I posted it yesterday!!! So fun!! What a pretty front door!!! That sure brightens the day. Wow so pretty!!! I would love to do this. We are moving into a new house and it would be a fun way to decorate the windows. The paint really comes off?? It scares me a bit 🙂 But that makes sense that it should come off, especially if you mix it with some soap. Is there like a time frame for keeping it on so it comes off easily? Yes, I’ve done it lots of times before! Have fun, Heather!! The project is cute, but I ADORE that last photo of your daughter! Her expressions is priceless! Oh I am digging this! My 4 daughters and I are going to do this in our sun room. It is 3 walls of windows. I am thinking trees on the sliding doors and flowers on the windows! Hello Spring! Yay!! That makes me so happy to hear that!!! Have fun!! Gorgeous! I love these. They are going in the next Things to Write Home About for sure. This has got so many teaching opportunities in it as well as the art & craft ones! Brilliant! I do this with my students and they love it! We use markers and then spray it with water and it turns into what looks like Tie Dye. Really pretty. Oh wow! I love this ! I just love your site so much! We will be doing this activity this week!